“Cukoo’s Nest” made such a deep impression on me, and when I discovered that he lived in woodsy, isolated La Honda, and I saw the cabin he lived in, I felt very close to this author I so admired. It was the 60’s–almost “romantic” now–remember Kesey’s day glo spray painted bus (now in the Smithsonian museum, driven there by Kesey himself a few years before passed) and the Merry Pranksters. The folks in La Honda did not appreciate Kesey choosing their neck of the redwoods to live and write and play in. Legend has it that on more than one occasion Kesey walked to his mailbox outside to find bullet holes in it. 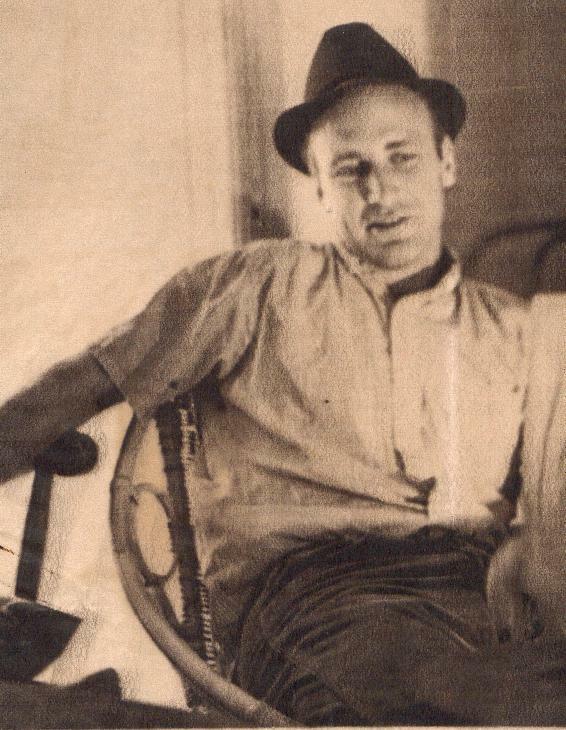 And of course Ken Kesey had his share of legal problems–I’ll try to get into a more detailed bio of the famous author in a future post because his past directly relates to the writing of that great book, “Cukoo’s Nest”. Ron Duarte of Duartes Tavern in Pescadero, Ron’s Aunt Carrie, now gone, once told me Ken Kesey came down from the mountains to take out books at the local library. She was the librarian, she would get to know everybody who took out books. When I was on the San Mateo County Historical Museum’s Board of Directors some years ago, I wrote Ken Kesey and asked him if he would contribute an article–or even a “fragment” to our historical publication, “La Peninsula”. I typed the letter on a typewriter, I think, and mailed it to his farm in Oregon. He had moved there from La Honda. I’m sure life there was more peaceful. Was I surprised when I received an answer from Ken Kesey. 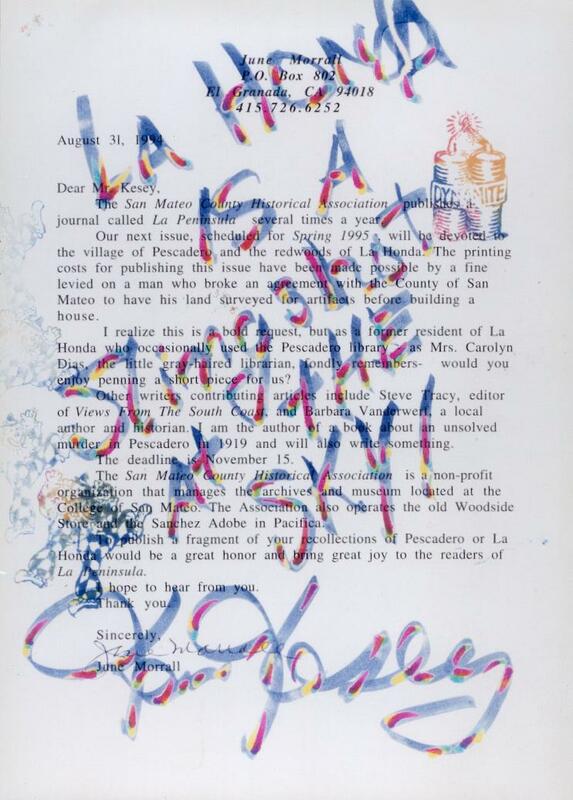 I must have been jumping up and down–he had used my typed letter to create a work of art with his magic marker pens. Here’s Kesey’s response to my request that he pen “something” for the county’s historical journal. When Ken Kesey was delivering the historic day-glowed magic bus to the Smithsonian in D.C., he stopped off in San Francisco at a book fair and I almost talked to him but he was in motion, moving here, moving there, physically, a small man, but he was a muscular ball of energy. I never knew Kesey personally but I will never let go of my old copy of “Cukoo’s Nest”, both a reminder of the culture-changing 1960s and of a great book filled with truths that will remain relevant forever.